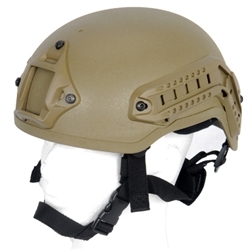 Modeled After the Modular Integrated Communications Helmet (MICH) that became widely used by military, police, and private agencies. Utilizing an advanced type of Kelver and improving the wearer's field of vision, the MICH remains a popular choice even with new designs being put forth. This model in particularly introduces another layer of combat efficiency by providing a platform that accepts accessories through the mounts found throughout the helmet. At the front of the helmet you will find Integrated Night Vision Goggles Mounts so you can keep your goggles at ready for whenever you need it. On the sides are side rails that can accept a variety of compatible accessories including flashlights or Go-Pro cameras (sold separately).